Eric Pitcher from the US wrote to me a couple of days back with an interesting problem he is facing in MS PowerPoint 2007. 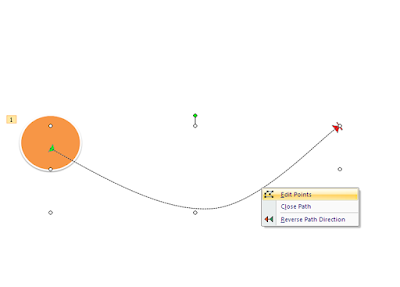 It relates to editing points in motion paths (under custom animation). Here is the problem in his own words. See if you can solve it. "I was wondering if you have had the same problem that I have when it comes to ‘Editing Points’ on motion paths. If I animate an object with a custom, straight line motion path, most of the time I am not able to edit or add points to it. For example, I want to make an object look like it is bouncing off of the bottom of the screen. I insert a clip art object on the screen and select to custom animate. In the menu I pick: Add Effect – Motion Paths – Draw Custom Path – Line. I draw the path line across the middle of the screen from left to right. Now here is the problem: I right click on the motion path to get the Motion Path Menu. However, the ‘Edit Points’ entry is grayed out and cannot be selected. The weird part is that I know this can be done since I am able to select ‘edit points’ once every 100 attempts. So I must be missing something. BTW: I am using PowerPoint 2007. Any thoughts?" If you have a solution to Eric's problem leave a comment here. In my experience, 'Edit Points' option is not available if you choose the 'Line' item. For others such as 'Curve', 'Freeform' etc, the option is available. Not sure, how you are able to select it even once if you try it 100 times or so. I agree with you. The option is inactive for line and active for styles like freeform, etc. Since we have an array of options to choose from that should not be a problem.